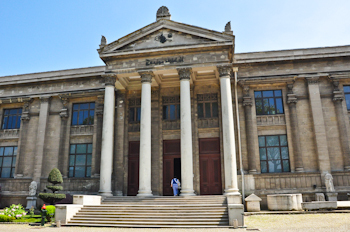 View of the entrance to the "world class" Archaeological Museum in Istanbul. Much of the rich collection contained in the museum was collected from all over the Ottoman Empire during the 19th and early 20th century. Since that time many additions have been made from more recent archaeological excavations in Turkey. Students of the Bible will be particularly interested in artifacts from Palestine/Israel that are located on the top floor of the building — namely The Gezer Calendar, The Temple Inscription, and the Siloam Tunnel Inscription—the latter two from Jerusalem.